With impending restrictions for truckers on the horizon, many drivers have resolved to sounding off in venues other than online - even if that means taking their opinions all the way to Washington. In the wake of the Department of Transportation's proposal to enforce commercial drivers to use speed-limiting technology, many drivers have voiced their opinions on either side of the matter, with a majority of drivers opposed to any speed-related legislature. 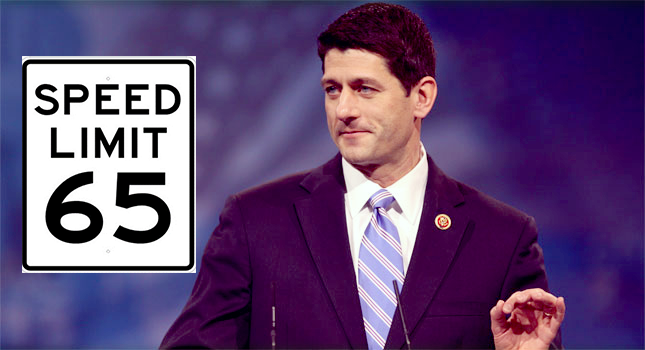 Steven Brown, a driver from Wisconsin decided to take his opposition to Speaker Of The House Paul Ryan himself, with a letter he penned explaining why he, as a driver, would not benefit from required speed-deferring technology. A driver for a small, private company, Brown's letter may mean more than simply a formal way of standing up for what he believes in. According to the Friends Committee on National Legislation, it is reported that writing a letter to Congress is a highly effective way to get one's voice heard, and in the eyes of the government, a written letter often means that several other people have the same opinion. It has been brought to my attention as well as others in the trucking industry that the American Trucking Associations has lobbied to restrict the speed of vehicles weighing more than 26,000 lbs.I and other drivers are very concerned about the future of our employment. The National Highway Traffic Safety Administration and Federal Motor Carrier Safety Administration have said that the cost of accidents would be greatly reduced if commercial vehicles were restricted to a lower speed limit and would also be a greener substitute for the environment. I have read in trade magazines that there will be public discussions regarding this matter. It appears to me, based on the time and location of these meetings, that the NHTSA and the FMCSA really could not care less about what drivers think — because drivers in this industry are rarely home. As a professional truck driver for 15-plus years, never having had a moving violation or accident on a public road while operating this equipment, this makes me believe there is more to this than safety. If anyone understands economics, it is obvious there is an underlying agenda. I make income based on cents per mile, just like [many] other truck drivers in the industry. When this restriction goes into effect, I can guarantee most, if not all, will not be compensated for what is lost. If I were to stay in the career of driving commercially over the road, my time at home would be virtually non-existent. It is just another way to tax the working class or create a simulated tax break for businesses. This also creates another problem, and you really don’t have to look very far from your back window in Janesville, Wis., [to see it]. On any given night, there are trucks all over the country trying to fight for that last parking spot— or an illegal one. My only solution is to shut down earlier or park sometimes 50 to 100 miles away just to make sure I’m parked safely. But I still have problems finding adequate parking. I have even been kicked out of D.O.T. scales near Seattle, Wash., with minutes to spare trying to find safe and legal parking. These scales have been built with federal monies supposedly to keep the general public safe. There is a driver shortage now; just wait and watch the parking problem explode along with an abundance of new inexperienced drivers. Since I live in Wisconsin and drive all over the country I have spoken to many other professionals in the trucking industry. Most of us (the working class) may not agree with each other about our political beliefs, but we do agree on one item: It’s all about the giant conglomerates. The large companies want to keep as much for themselves as they can. If I decided tomorrow to buy my own truck and this specific regulations would go into effect, this would absolutely destroy my business and other small businesses. This would create a pseudo-monopoly. Safety is important to me and my family, as I am sure it is to yours. The untold truth, which I have witnessed firsthand, not only in the trucking industry but in other industries as well, is as follows: Safety is only discussed when it costs companies money. If highway safety is truly a concern, states would not have raised the speed limits. Also, with technology, texting and data services wouldn’t operate while a vehicle is in motion. (Rest assured if a truck is moving slowly, someone will rear-end it while texting at a higher speed, most likely an automobile. Often, when an accident occurs with a truck, the general public blames the truck driver. Moreover, whether it is the truck driver’s fault or not, it negatively affects the safety [record] of the truck driver.) Let’s have a zero tolerance for drunk driving for automobiles, too. This hasn’t happened — telecom and alcohol companies have deep pockets and lobbying firms. I was hoping to retire doing what I love, but I have to be honest and say that I should have chosen politics instead. At the end of the day I am sure somehow this will fall on deaf ears and/or blind eyes, since I don’t have a super PAC or a lobbying firm to back this up. I also can’t promise a politician at my organization a position when someone decides to hang up a political career. Both political parties are guilty of this. A few final thoughts: “The path to hell is paved with good intentions.” The next time you vote, please think of this — are you voting for your own personal interests, the lobbying interests, or those of Joe Common American? Be thankful that I pay my fair share, because without it politicians would not have their excellent benefits. Hopefully I can retire and receive my retirement wristwatch or golf bag, since my 401k will be depleted by unknown fees. If somebody could profit by making the First Amendment illegal, it would have been done already. We will agree that big government isn’t the answer, but neither is big business. They are practically identical. If bankers were truck drivers, there would not be income-restricting regulations. Be a politician for the people. Take 15 minutes and ask one truck driver anywhere what his/her thoughts are. I have. The sentiments contained in this letter are agreed to by truck drivers all across this land. Please don’t hesitate to reach out to me. Interested in writing your own letter to congress to voice your opinion on this matter? Check out the National Court Reporters Association on how to relate an effective point to your government. That was very well spoken to bad it will fall on deaf ears of our usless political universe just park let this unappreciative country go hungry for a while. Have you commented in the correct forum to make your thoughts heard by the people that need to hear them?